Today’s warm temperatures and south winds brought an orange sulphur butterfly to our garden. Normally a common butterfly, this is the first one I’ve seen all year. The orange color on the upper wing, and dark black spots help to distinguish it from other sulphur butterflies. Adults drink nectar from many species of garden flowers; this one visited garden phlox and asters. The caterpillars prefer red clover, white clover, vetches and alfalfa. Other insects seen in the garden today include a potter wasp, paper wasps, bumble bees, honey bees, metallic green bees, flower flies, cicadas and an autumn meadowhawk dragonfly. An orange sulphur butterfly (Colias eurytheme) drinks nectar from garden phlox. This entry was posted in Autumn, Backyard Nature, Butterflies, Garden, Saint Paul, MN and tagged Colias eurytheme, garden, insects, orange sulphur butterfly, St. Paul MN. Bookmark the permalink. Beautiful! 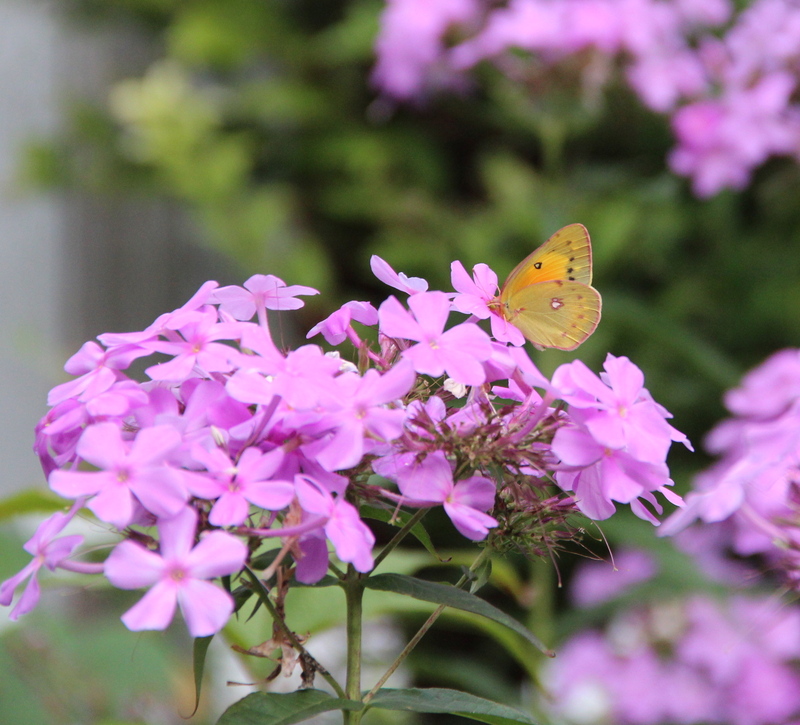 I love the color of the butterfly against the phlox . . . What a striking photograph.